Negotiations fell flat in the Senate Sunday as legislators butted heads over the issue of automatic spending cuts, failing to sign a deal that will reopen the federal government and avoid a possible default. Although both sides insist that they're looking to reduce the deficit in the long run, Democrats have, right now, the upper hand. 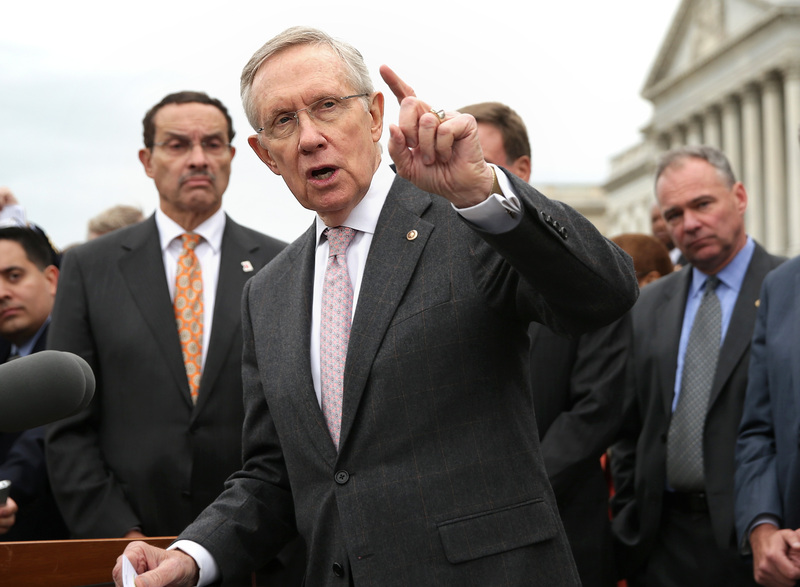 Once the risk of defaulting is gone and the shutdown is over, Republicans may have more sway. With the clock running out on the country's borrowing authority, discussions have shifted away from what had previously dominated negotiations — the Republican efforts to gut Obamacare — and are now focusing again on budget issues. Democrats, who had been working hard to avoid any concessions on the Affordable Care Act, are now instead trying to make sure sequestration lasts only until mid-November — Republicans want the across-the-board spending cuts to last for as long as possible. They're holding that any move on the part of Senate Democrats to undo the sequester cuts would have no hope of passing the Republican House. For a short time yesterday, there was hope that a bipartisan bill drafted by Sen. Susan Collins — which would have raised the debt cap through January, but delayed tax on medical devices and require income level verification for health care enrollment — would be diplomatic enough to convince legislators to agree. But Democrats objected to the measure, saying it would allow sequester cuts to continue through March, and permit another round of automatic cuts to go into force on Jan. 15 — giving them little to no time to renegotiate. With the government shutdown now on day 14, the debt ceiling looming, and Republicans tanking in the polls (in spite of efforts by Senator Ted Cruz and former Gov. Sarah Palin of Alaska to garner support by leading a rally on the National Mall Sunday), Congress is running out of time. The shutdown has already cancelled military training missions and caused the furloughs of roughly 350,000 federal workers, and if a deal isn't reached to raise the debt ceiling by Thursday, the government will soon run out of money and risk defaulting on its obligations, sending the economic world into a tailspin. The House plans to convene at noon today, after which the Senate will meet at 2 p.m. — no votes will be taken until this evening at 6:30 p.m.